The history of Wilshire Boulevard Temple mirrors the history of the development of Los Angeles. Knowing the history of your city and community create a greater connection and sense of belonging. 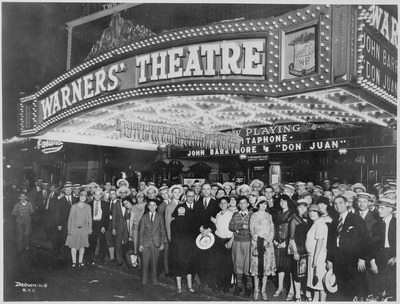 The design of WBT and the creation of the Murals was inspired, in part, by the influence of Hollywood and the expanding impact of visual media in the 1920’s and 1930’s. What historical experiences and events inspired the design of Wilshire Boulevard Temple in 1929? Why does knowing the history of a building and community matter to us today? How do these stories affect our sense of Jewish identity as WBT community members today? ACTIVITY #1 --What Does a Changing Community Look Like? For students to appreciate the dynamics of a changing city and an evolving Jewish community, begin with this activity which asks them to reflect on their own observations of community change in their city today. RESPONSE CARD DISCUSSION: Hand out one blank index card to each student. Ask students to take 5 minutes to write down 1) a change they have seen in their city or neighborhood over the past five years and 2) a change they have seen in their Temple, or Jewish community over the past five years. Sit students in a circle if possible. Ask them to pass their cards to the person on the right. If that person agrees with the changes written on the card, they should make a check at the end of the sentence. Every student should read each card and add their checks. Once everyone has responded and has their card back, ask them to count the checks. Read aloud the cards with the most checks. Discuss: 1) How do they feel about the changes they wrote down. 2) How do they think the changes will impact the city and the Jewish community in the coming years. 3) What do they think are the reasons these changes are happening. Conclude: Cities and communities are not static. They change and evolve over time in response to influences that are structural, economic, environmental and cultural. Now that we've discussed how we see changes in our community today, let's look back in time to some of the influences that started some of these changes in motion. Project the section below and ask students to open this page in their phones. Assign students to read aloud the sections below. Discussion questions follow each section. In the previous section we saw how the Jewish community took root in Los Angeles. In two generations Los Angeles' population exploded. New roads, buildings and growing centers of culture and commerce pushed the development of the city into previously unexplored areas. 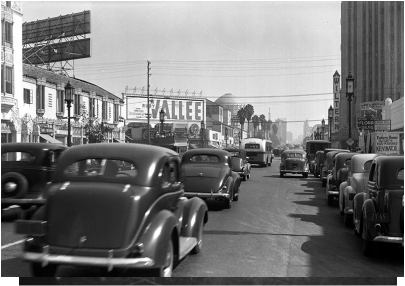 By the late 1920's Wilshire Boulevard was developing into a modern thoroughfare, created for a new kind of Angelino who was now in cars driving everywhere. Downtown L.A., where the first Jewish community sprung up, was viewed as a remnant of the past; Wilshire Boulevard represented the future. By 1921 B'nai B'rith's Ninth Street Temple was becoming too small for the community. Temple leaders decided to invest in a new and up and coming neighborhood and bought land along Wilshire and Hobart. The community proceeded to build a majestic new Temple, which took its place alongside other prominent houses of worship on the boulevard. 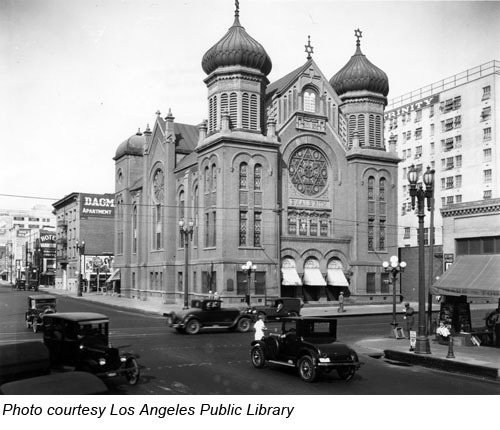 In 1915 as the congregation continued to grow, Edgar Magnin, a new associate Rabbi joined Wilshire Boulevard Temple. In 1915 there were 550,000 people living in Los Angeles, with about 10 – 12,000 Jews. Congregation Bnai B'rith had 330 families as members, and its leadership still included the sons, daughters and grandchildren of the Hellman’s, Newmark’s, Lazard’s and other pioneering Jewish families. By 1929 the numbers were growing along with the city and a new building would enable the congregation to be, "housed in a manner befitting its dignity and importance." Magnin was the inspiration and vision behind the design of the new building-- and the murals which graced the Sanctuary. The building the new Wilshire Boulevard Temple replaced. Congregation Bnei Brith's second Temple was in downtown L.A. on Fort Street and 9th. Built in 1896. In the 1920's and 30's, automobiles were overtaking the city's trolly cars and transforming the city with Wilshire as one of the main arteries running east to west. L.A’s first department stores set up shop along the wide sidewalks, with large display windows set up so drivers would take notice; the idea of parking lots took hold so drivers could be enticed to park their cars and shop. As the epicenter of shopping, traffic and fashion, Wilshire Boulevard of the 1920’s and 1930’s became a site of architecturally fashionable buildings, including dramatic new houses of worship, all aimed at the newly mobile, upscale Angelinos. It made sense to the forward thinking Rabbi Magnin to build a synagogue on this prestigious new boulevard. The new building cost 1.5 million dollars. The money was raised entirely by the congregation. 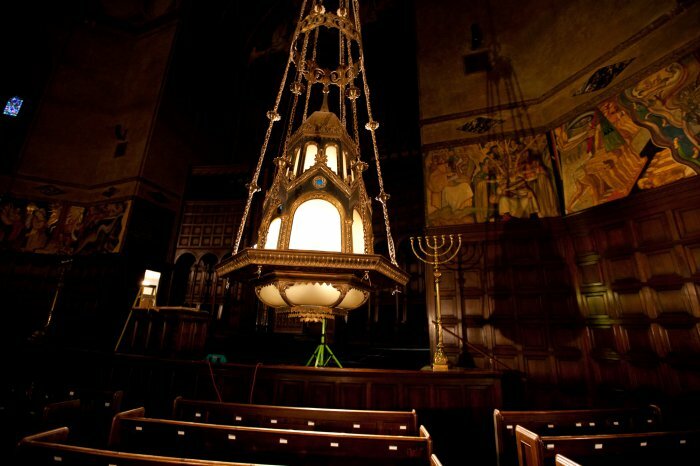 The architects were A. M Edelman, son of the congregation’s first Rabbi, who had also designed the Ninth Street synagogue, and Tilden Norton, whose family were longtime members. Congregation B'nai B'rith’s name was officially changed to Wilshire Boulevard Temple in 1937. Describe the differences then and now. 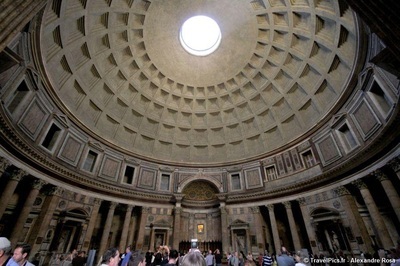 Why do you think the architectural style of a single big dome was chosen? Does it remind you of any other buildings you have seen in books or travels? READ ALOUD & SHOW THE IMAGES BELOW: The changing L.A.cityscape, ancient discoveries in the Middle East, and inspiration from Hollywood all contributed to the design of the new Temple. The design of Wilshire Boulevard Temple was first contemplated in the late 1920s, when Rabbi Magnin toured some of the great cathedrals and buildings of Europe, for ideas and inspiration. He decided on the architectural style called Byzantine Revival. This style from the Byzantine Empire (400-1200 CE) blended Turkish and Roman architectural styles. 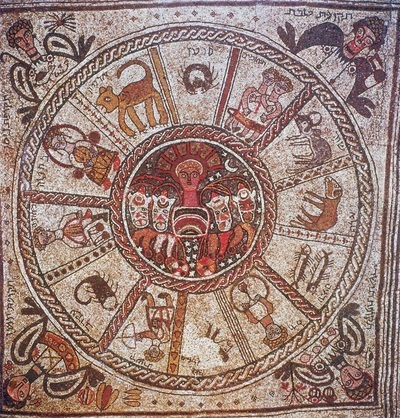 Characteristics included domes, round arches, circular windows, and elaborate carvings and mosaics. See how the dome and rounded arches of the Temple are similar to the ancient Pantheon in Rome, whose image is below. 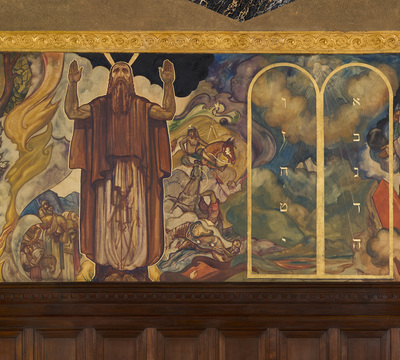 The murals which wrap around the Sanctuary in the Wilshire Boulevard Temple were a unique and unprecedented addition to modern synagogue design at the time. Think about other synagogues you have been in. Why do you usually not see paintings or sculptures in Synagogues? The Second Commandment--- Thou Shalt not make graven images has long discouraged figurative art, featuring human forms, in the synagogue. Yet, despite this, Magnin made the bold decision to include murals in the new sanctuary and expected them to be a learning tool, not as something to be worshipped. 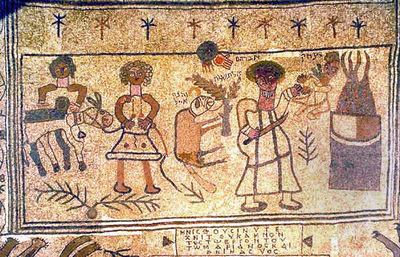 As he wrote: “The purpose of omitting paintings or sculpture in synagogues goes back to the Second Commandment, which aimed to avoid idolatry, but ancient synagogues have been unearthed in Palestine and elsewhere that did have paintings or mosaic figures. In this modern age, when people are less familiar with the Bible and Jewish history, I thought it wise to depict some of the great prophets and sages." There were many sources of inspiration for the creation of the murals. 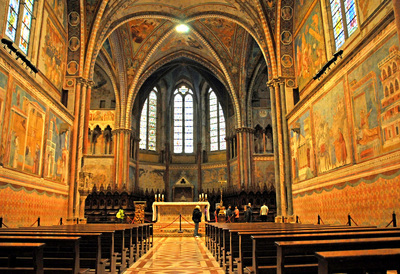 Rabbi Magnin was inspired by by the richly painted cathedrals of Europe and the spiritual feeling they evoked. He was well aware of the buried ancient synagogues found by archaeologists in Israel and Middle East and the surprising discovery that they were decorated with human figures and scenes from the the bible. 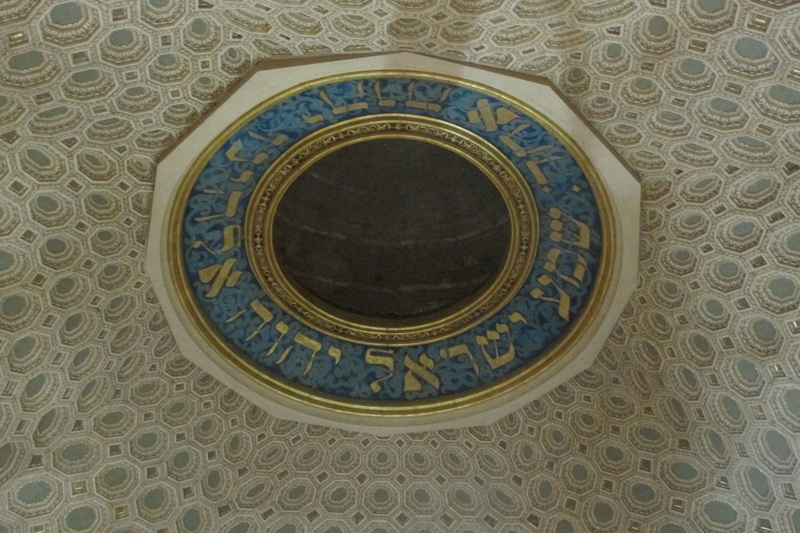 This confirmed that there was indeed a Jewish tradition of figurative art in synagogues. 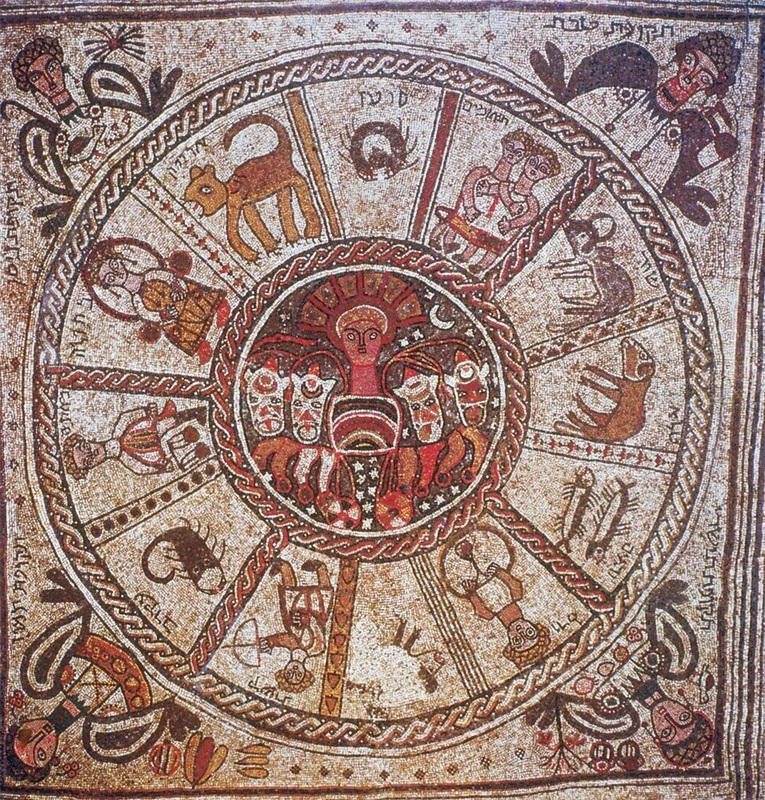 The two images below are from the Dura Europas synagogues excavated in Syria. It is unique among the many ancient synagogues that have emerged from archaeological digs as it was preserved virtually intact, and it has extensive figurative wall-paintings. 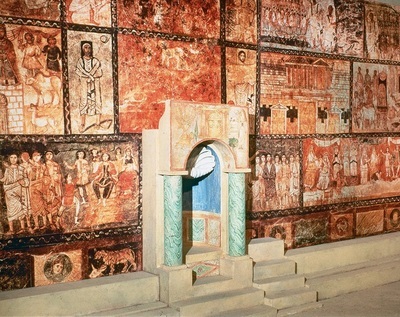 Dura Europas was built in approximately 244 CE, making it one of the oldest synagogues in the world. Project the images below. 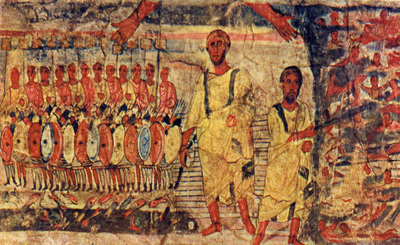 Compare and contrast the images of Moses crossing the Red Sea from Dura Europas in Syria, 244 C.E. and from the Wilshire Boulevard Temple Murals, Los Angeles, created in 1929. How do the different styles of painting reflect the times they were created? What is emphasized in the imagery? What symbols are present? What do you think the hands represent in both images? SHOW THE IMAGES & FILM CLIPS BELOW & READ TOGETHER:﻿ 1929 when this Temple was built, movies were just becoming popular. Rabbi Magnin was very aware of popular new media and how powerful images from movies, magazines, billboards, and the newly accessible television, could influence and inspire people. 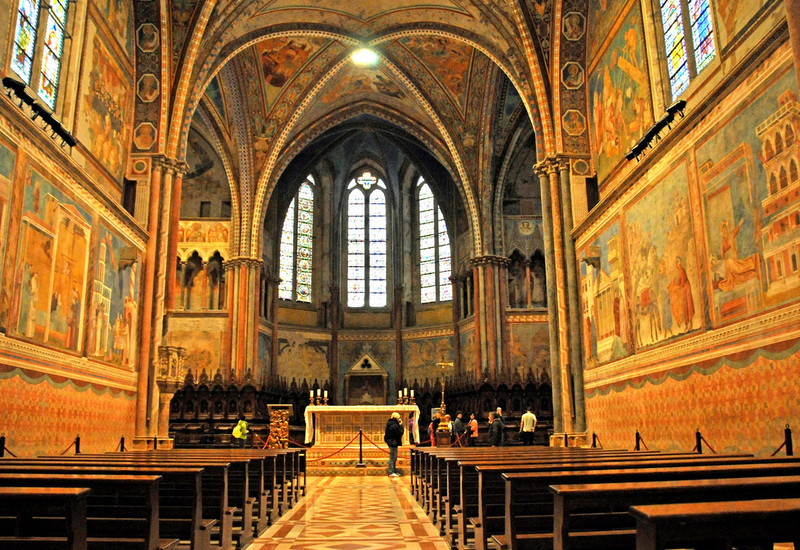 “The day is over when Jews are likely to worship images and paintings, " he said. "Seeing our history in painted form, activates the imagination and creates curiosity for deeper knowledge of our own Jewish traditions. 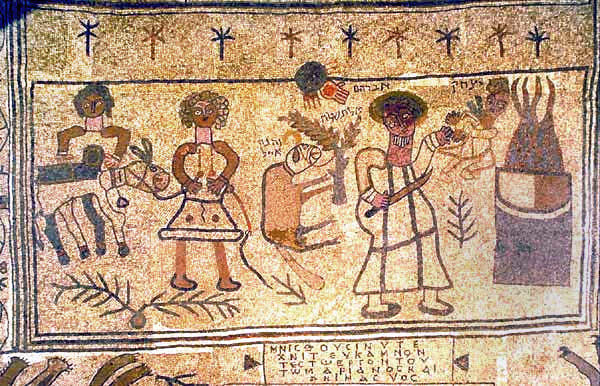 In the past when Jews knew their own history and lived traditional Jewish lives--there was not a need for Jews to see illustrations of Jewish life! But In these times, when Jews are less religious, and with Hollywood movies, comic strip heroes and television more popular-- visual imagery would be an effective way to teach about Jewish life, and uplift the spirit!." Magnin believed that murals in the Sanctuary would visually engage his congregation and provide "a learning tool" to tell the shared story of the Jewish people and their traditions and values. The biggest driving force for the realization of the murals came from Temple supporters and Hollywood Studio Heads Jack, Harry and Abe Warner who provided funds for the murals and donated the time and talent of their studio set painter Hugo Ballin. 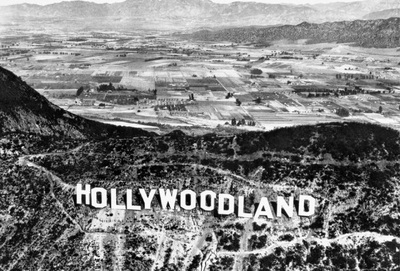 Support of the Hollywood producers who were early Temple members enabled this vision to be realized. Examples of Hollywood Visual Media from the 1920's, created by the studios of movie producers studios who were Wilshire Boulevard Temple members. 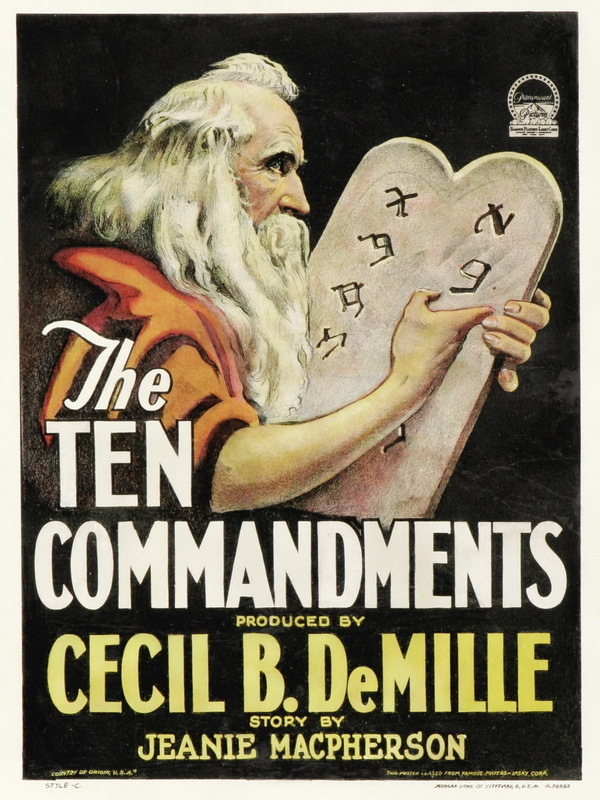 Play a few minutes from director Cecil B. Demille's 1923 silent film The Ten Commandments. His second version of the Ten Commandment was filmed in 1956. To see a surprise discovery about the giant Sphynx used in the 1923 film click here. Film poster for 1956 film. 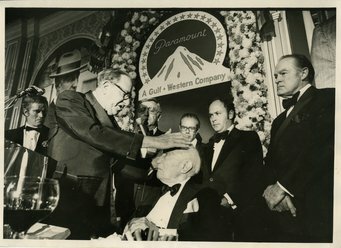 Rabbi Magnin blessing Paramount Studios founder Adolph Zukor, producer of The Ten Commandments 1923 silent film. Posing for the camera outside the Warners' Theater before the movie premiere, 1926. Courtesy of U.S. National Archves. 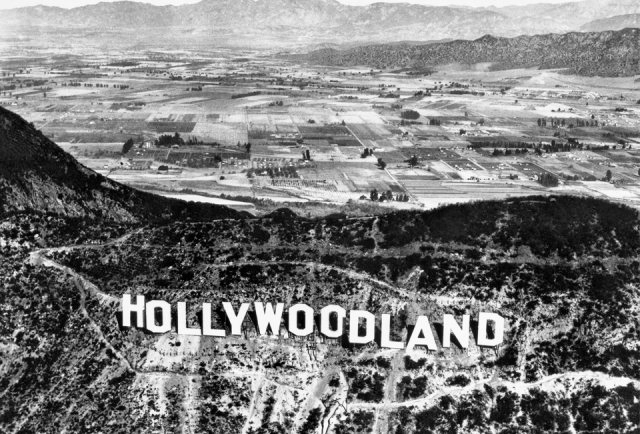 READ TOGETHER: In the early 1920’s, Los Angeles became the epicenter of a rapidly expanding movie industry. production. The most prominent movie producers were a group of Hollywood Jews who called Magnin their Rabbi and Wilshire Boulevard Temple their Jewish home. These producers and studio heads contributed dramatic and enduring elements of the new Temple's design. 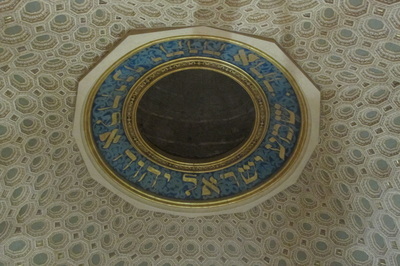 Irving Thalberg (co-founder of MGM Studios) donated the cost of painting the Shema prayer that frames the oculus, the open eye at the center of the dome. Louis B. Mayer (the other co-founder of MGM Studios ) donated the east- and west-facing stained-glass windows. Carl Laemmle (founder of Universal Studios) donated the cost of the bronze Havdalah spice box-inspired chandeliers; and three Warner brothers, Jack, Harry and Abraham, donated the funds and services of Warner Brothers studio artist Hugo Ballin, to create the murals surrounding the Sanctuary. Why was the movie industry so appealing to these Jewish immigrants? Neal Gabler writes in his book An Empire of His Own, that because of social hierarchies and prejudices which created barriers for Jews and other new immigrants, there were many professions that Jews were not allowed to enter in the 1920's and 1930's. The new movie industry had appeal as it was a small investment to buy a projector and rent a theater-- and profits ran high. As immigrants, the new producers were sensitive to the dreams and aspirations of other immigrants and working class people for whom the movies provided recreation and escape. Jews adapted quickly to the business; having come from the garment industry and retailing, they understood the market swings, how to package and sell films and how to deal with competition. Gabler notes that what united them deeply was their utter and absolute rejection of their pasts and the absolute deep devotion to their new country. Above all they wanted to be regarded as Americans; they wanted to reinvent themselves here as new men. Deprived of access to status and gentile institutions, this driven group of men in the movie business saw the possibilities in Los Angeles and over a decade built a powerful motion picture industry, along with a new vision of the American Dream. Wilshire Boulevard Temple is a community continually reinventing itself as it adapts to an evolving Jewish community and city. In 2011 the historic Temple on Wilshire and Hobart underwent a massive renovation and restoration to preserve the unique architecture and murals and create more space for a growing community on the east side of Los Angeles. It has been rededicated as the Erika Glazer Campus and is now home to the Erika J. Glazer Early Childhood Center and Brawerman Elementary School East. To conclude, watch this short film about the renewal and renovation of the historic Wilshire Boulevard Temple Sanctuary. When Wilshire Boulevard Temple was being built in 1929, other important houses of worship were rising up along side it, as the neighborhood transformed into a center of influence and commerce in the city. 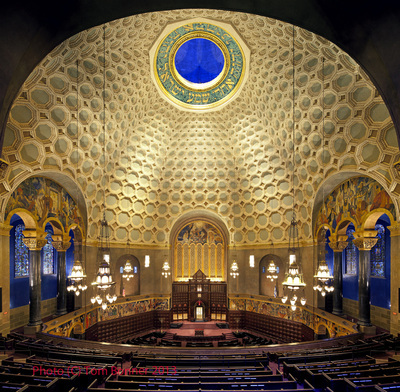 Wilshire Boulevard Temple is the only synagogue on the boulevard, yet it shares many common architectural features with the other sacred spaces. The L.A. Conservancy works tirelessly to preserve and educate about the historic buildings and neighborhoods of our city. Use their website activity: Curating the City: Wilshire Boulevard to plan a walking tour of this iconic street which is the longest in Los Angeles.